According to its website, "VOSviewer is a software tool for constructing and visualizing bibliometric networks. These networks may for instance include journals, researchers, or individual publications, and they can be constructed based on citation, bibliographic coupling, co-citation, or co-authorship relations. VOSviewer also offers text mining functionality that can be used to construct and visualize co-occurrence networks of important terms extracted from a body of scientific literature." 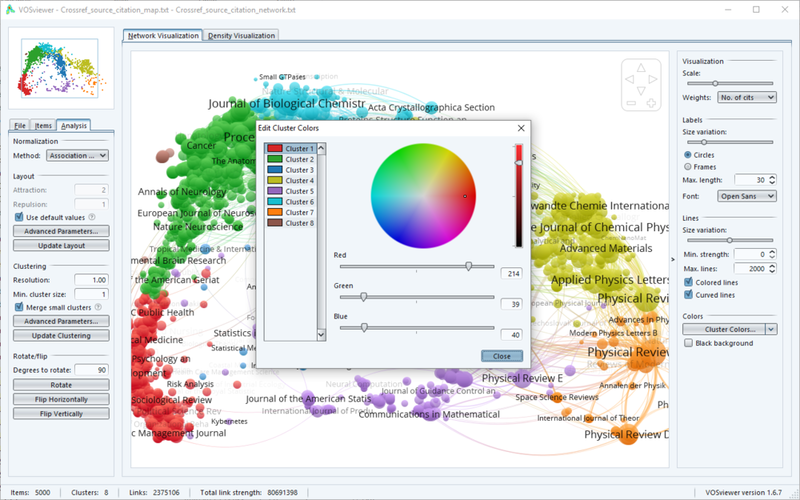 Developed by the Centre for Science and Technology Studies at the University of Leiden, VOSviewer works with bibliographic formats from Web of Science files, Scopus files, PubMed files, RIS files, and Crossref JSON files. It is not open source, but it is free to use: the license reads "Copyright (c) 2009-2018 Nees Jan van Eck and Ludo Waltman. It is permitted, free of charge, to use and/or distribute this software, provided that the above copyright notice and this permission notice are retained. It is not permitted to modify this software." Version 1.6.7 was released in February 2018. This description has been contributed by 'Amanda French' and appeared first on the Dirt directory. It has been re-used under CC BY 4.0 license.